Our time designing and installing many different styles of fireplace has given us the experience needed to be able to offer you a full service from design through to supply and installation. You can put your trust in us to aid you in creating a stunning focal point in your home. We are committed to ensure that every customer receives unparalleled customer service, and that the journey to picking your perfect fireplace will be an enjoyable one. 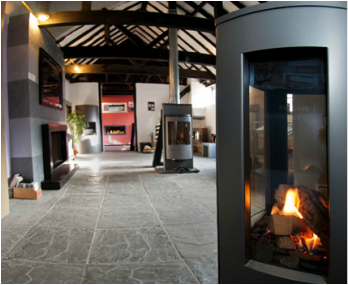 Our showroom staff and fireplace designers have the experience and expertise to understand your requirements, and assist you in making the right choice, while our dedicated installation team can provide a hassle free fitting and perfect finish. We work with some of the UK’s top housing developers and designers, as well as appearing in popular TV shows, including Grand Designs and 60 Minute Makeover. We pride ourselves on being a showroom based company, where expert advice is on hand every day to help you make your perfect choice. Our showroom in Abridge, Essex, is housed within a building dating back over 400 years. It proudly displays one of the largest collections of fireplace and stove designs anywhere in Essex, London or the Home Counties. Located just inside the M25 close to Chigwell and Theydon Bois, we have over 2000 square feet of displays in nine separate rooms. With displays ranging from traditional and period style fireplaces and stoves, to many modern and contemporary designs, you are sure to find the perfect fire for you. Our working displays of wood burning stoves, gas, electric and bio-ethanol fires are sure to instill you with the warmth and comfort that a new fire would bring to your home.